Among the cute, cozy cafes, Maman in Soho opened in Fall 2014 is a new addition to that list and really hits the spot. The interior of the cafe is rustic chic inspired by French boulangerie with blue and white floral tiles that is also used on their disposable cups which is too pretty to throw away. During my visit last winter, I had their lavender hot chocolate which lavender anything in food may not be suitable for all taste buds but the floral taste and bitter sweet chocolate is surprisingly a nice balance. Maman also serves no fuss takeaway meals that includes salads, quiches, and rotisserie chicken and is perfect for the busy New Yorker on the go. Since their Soho location open, Maman has expanded and can now be found in Tribeca, Greenpoint and Toronto, including their offshoot rotisserie chicken takeaway place Papa Poule which is still on my list of places to visit. Chef Andrew Carmellini of NoHo Hospitality Group, Bar Primi is the reincarnation of this corner Bowery restaurant, formerly the beloved restaurant Peels. With the rise of gluten intolerance and for some people who choose to be gluten-free is missing out on one of the best squid ink pastas. Bar Primi, squid ink campanelle is worth breaking the rules. With generous portions of crab meats blended into the pasta and with a subtle hint of fresh red chili pepper. It is a reminder of how delicious and complex the flavors are for a simple pasta dish when it is done well. It’s true when they say, “Once you go black you can’t go back.” I should also mention the baguette at Lafeyette their sister restaurant is also exceptional. New York City classic breakfast, smoked salmon or lox cream cheese bagel has made a comeback in recent years and this year the bagel game is strong. There is the legendary, family owned and operated for over 100 years, Russ & Daughters. Their deli remains a quintessential New York experience. Order the lox bagel with the works which includes tomato, onions, capers with thinly sliced choice of fresh wild salmon is truly the breakfast of champions. There are the new kids on the block, Black Seed Bagel and Maiden Lane both open their second or third locations in Manhattan this year, also serves smoked salmon bagels. Black Seed Bagel is a take on the Montreal bagel. The bagel is delicious on its own but by all means go all out on on their signature sandwiches, the smoked salmon is highly recommended. Maiden Lane known for their tin fish and bar also serves an excellent smoked salmon bagel on a hip Baz Bagel. The best thing about a bagel is it will last for at least for two meals or of course sharing is an option with someone special. Sadelle, you’re on my 2016 list. What I noticed in my recent visit to Jackson Heights is the format of the restaurants. There is the cafeteria style for takeaways on the ground floor and above is a banquet hall version which is brilliant. It is a way to provide food accessible for all and for any occasion. I was invited to my sister’s friends dinner at Kabab King. From the name you guess it they’re known for their kababs. The restaurant has an extensive menu of Middle Eastern style kababs, traditional Indian naan and biryani to Chinese haaka noodles. The customers range from families, seniors, men and then there was us. Imagine children running around, while waiters carrying trays of lassi and men tearing up a stack of naan while a serious game of cricket was on television. Platters of food are served family style, beef, chicken, lamb kababs, goat biryani, lamb chops, curries and stews. Every dish was bold in flavors and a feast meant for a king. Queens was named No. 1 tourist destination in U.S.A in Lonely Planet this past year. It’s the borough of new immigrants where they bring their exotic flavors which is usually authentic and a lot more affordable. Hot Kitchen Sichuan Style in Flushing is an example and is the new restaurant that has taken over formerly known as Little Pepper. I came here recently after a day at Spa Castle and had hot and sour soup, mapo tofu, lamb cumin, stirred fried string beans and Sichuan chicken. Every dish was delicious, seasoned well and soulful. If you can endure the heat and spiciness, a couple of sweat bullets wouldn’t hurt then Hot Kitchen Sichuan Style is worth the trip. I was first introduced to authentic tacos served in soft tortilla oppose to the hard shell at Tehuitzingo , a hole in the wall deli in Hell’s Kitchen. Fast forward to 2015, everyone with the desire to sell food seems to be selling tacos because it is a lucrative food business and very often translates to awful tacos. Goa Taco is not one of those and has taken a traditional Mexican dish and reinvent it with an Indian twist. Instead of a tortilla soft or hard shell, it is served on a flaky paratha flatbread. The fillings are Indian inspired as well, stuffed with paneer, masala chickpeas and there are the more Westernized ingredients options like butternut squash and kale. There is also Empellon Al Pastor in Alphabet City, thanks to my friend who brought me here, I am now addicted. Al Pastor is a Mexican taco meets Lebanese shawarma, the best of both worlds. The pork is spit-roasted, a common technique for lamb shawarma and is delicately, thinly sliced onto a house made tortilla and is topped with some pineapples for an acidic kick. This technique was introduced by Lebanese immigrants to Mexicans and is a great example of why immigration and cultural diffusion is awesome when great food meets. There is no shortage of fried chicken in New York City and the fried chicken sandwich seems to be the star of 2015 and it is only the beginning. Chef David Chang of Momofuku empire introduced his fried chicken sandwich with Fuku. Visually, the fried chicken and bun ratio is intended to be out of proportion and those on low carb diet may prefer it including myself. There is the new fried chicken with Chef Daniel Delaney’s, Delaney Chicken. The fried chicken and bun ratio is less or more equal with Delaney Chicken sandwich and it is a little slightly more seasoned with mayo, hot sauce and pickles which creates more substance. The fried chicken sandwich as I recalled was juicy and the bun was large enough to hold the grease. A fried chicken sandwich is certainly not the everyday ordinary meal but for those who loves fried chicken like I do then it is the best item added to the fried chicken repertoire. Labor Day weekend unofficially marks the end to Summer days. With the long weekend and on a tight budget, a staycation is ideal. My friend and I decided to bike our way to High Bridge Park the aqueduct which reopened this year after being closed for the last 40 years. After making our trip there, we cruised through Harlem and nothing shouts summer more than a seafood shack, at Lolo’s Seafood Shack. Its perfect for a summer day with their outdoor backyard seating with a bucket of crabs and pitcher of beer. I had their soft shell crab sandwich served on their signature in -house bread known as Johnnycakes which was a delightful treat to refuel my bike ride home. Every girl most likely played tea party as a child. For my summer staycation my friends and I dressed up for the occasion and spent an afternoon indulging high tea like proper ladies at the Ritz Carlton by Central Park. High tea occurs between anytime between 2pm – 4pm. We each got a pot of tea and was presented with a three tier selection of tea sandwiches, scones and petit fours. The whole experience was relaxing and extravagant. A royal custom I can get used to. The one thing I’m most excited about working in Manhattan again is not only the convenience but Rafiqi’s food cart. I’ve seen this Halal cart around town before but never really interest me until now. For $5 Rafiqi’s has on the menu options like falafel, gyro and my favorite is the chicken rice platter, covering all the food nutrition a person needs. For $5 comes with an impressive assortment of vegetables that includes lettuce, tomato, black olives, corn, red onions, cilantro, the legumes from the black beans and the fluffy yellow long grain rice and protein from the chicken topped with the mysterious white sauce. A great meal to power through the work day on a friendly budget. Senor Pollo in the East Village specializes in Peruvian rotisserie chicken and on a lazy day or really any day is a great dish for takeaway to add a bit of oomph to any meal. The housemade green sauce or Peruvian Aji sauce is amazingly good. Its traditionally used as a dipping sauce for Peruvian rotisserie chicken and I use it on my cubano sandwiches. Don’t forget to ask for extra green sauce! 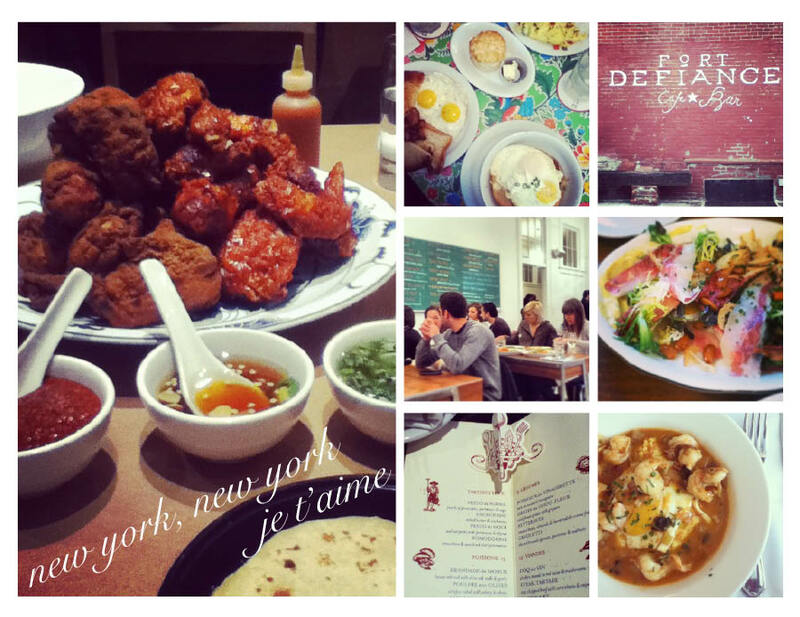 Aside from Buvette, there is a lack of good French restaurants in New York City. When my friend suggested Le Jardin Bistro because they had escargots on the menu, I had to go! My friends and I went there in mid- June shortly before it permanently closed. Le Jardin Bistro had all the classic French dishes, cassoulet, coq au vin, bouillabaisse, steak and frites it was like eating out of Julia Child’s Mastering the Art of French Cooking cookbook, a very home-style French cooking. The restaurant located on Avenue C had a second level with a beautiful patio and during our meal there it was magically lit by natural sunset. Dining at Le Jardin Bistro felt like miles away from the city and this gem will surely be missed. Isa /// For the last couple of years my girlfriends and I have celebrated each other birthdays over a shared meal. For the third consecutive year, I chose brunch cause it’s my favorite meal of the week. Our past brunch includes: Essex Street and Cafe Mogador and I sure do have the greatest friends who would sacrifice in the frigid cold to the verge of frost bites for a table with me. So this year I had picked a brunch spot that would take reservation and Isa in Williamsburg, Brooklyn conveniently does via Opentable.com. It was a luxury to be seated immediately to a table. Isa, a cozy little restaurant infused with the perfume of bacon and a wall display of cut wood feels like dining in a cabin, it’s a treat for any city girl who is nature deprived like myself. On the menu is their signature breakfast pizza – yep you read that right, pizza for breakfast topped with two sunny side up and bacon which you cannot go wrong. Rose Water /// Located in Park Slopes on Union Street is Rose Water. A nice neighborhood brunch spot that is more than the average salmon egg benedicts or omelette. They have a prix fixe menu that includes a drink like a ginger pear or hibiscus juice. I had the smoked fish cake with poached eggs and salads which the batter of the fish cake was bread crumbed or panko dressed with chipotle salsa. I think what really stood out was a side of fuji apple pancakes with walnuts. I rarely see pancakes as a side dish on the menu which should probably appear more often as a side dish to devour without the guilt. Freeman’s /// The same owners behind Isa owns this charming restaurant, Freeman’s tucked in the heart of Lower East Side, Freeman’s Alley. We celebrated my good friend’s birthday at Freeman’s. The decor similar to Isa has a heavy nature theme with taxidermy in every nook but somehow achieved tastefully without feeling like eating at the Museum of Natural History instead I can spend hours exploring each corner and admiring the decor. The food was up to standards and I was quite frankly nauseous from eating eggs from all the brunches we’ve had that I had opted for a roast pork sandwich with fries instead which was delish! Jack’s Wife Freda/// There is always a massive brunch crowd for Jack’s Wife Freda on the weekends. Instead I recommend going either during the end of brunch service or thankfully they serve brunch during weekday too! The menu at Jack’s Wife Freda is Mediterranean inspired and it was my first time I even heard and had a shakshuka which essentially are baked eggs and their version is with a salsa verde. I love the Stumptown bottomless drip and the whimsical tiny touches to the restaurant from the menu, sugar packets and stationery. A fun, casual spot for a meal to unwind with friends. The Fat Radish/// There are many restaurants who claims that they are farm to table but The Fat Radish goes beyond the farm to table model and support local purveyors like Saxelby Cheesemongers not too far away from their restaurant for fine cheeses on the menu. The chefs/ owners of The Fat Radish are from Great Britain, so naturally I had to have the seasonal celery root, gruyere cheese pot pie for one and pot pie for brunch? – Yes, please. It’s hearty, soulful and comfort food at its best. With rustic table tops and natural sunlight through the skylight makes it one of my favorite neighborhood gems. Their newest Upper East Side restaurant is worth checking out too, The East Pole. Friend of a Farmer/// Irving Street is one of my many favorite streets in New York City, located below Gramercy Tavern and not too far from Union Square is home to Irving Coffee, Beford Cheese Shop and Friend of a Farmer. They have quite a list for brunch with various filling combination for an omelette that you could imagine. The best dish however, was their special of the day, crab cake on English muffin which I was picking off from my cousin’s dish. The pros of dining at Friend of a Farmer it was surprisingly a pleasant family friendly dining spot with children under the age of 5. A treat on a rainy Sunday afternoon. The weekend is a time to unwind, relax and recharge from the work week and the last thing you want to do is wait for a table. 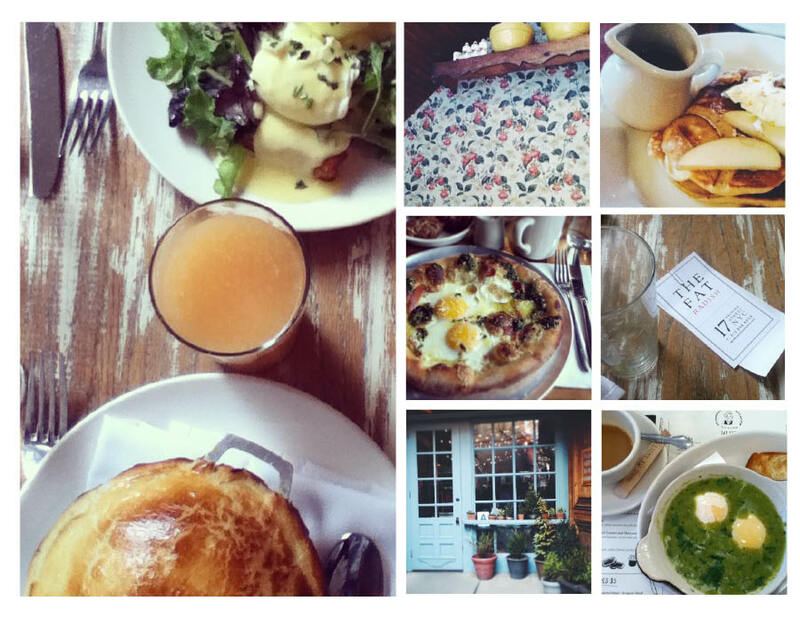 Make a reservation at Opentable NYC restaurants page for your next brunch date. 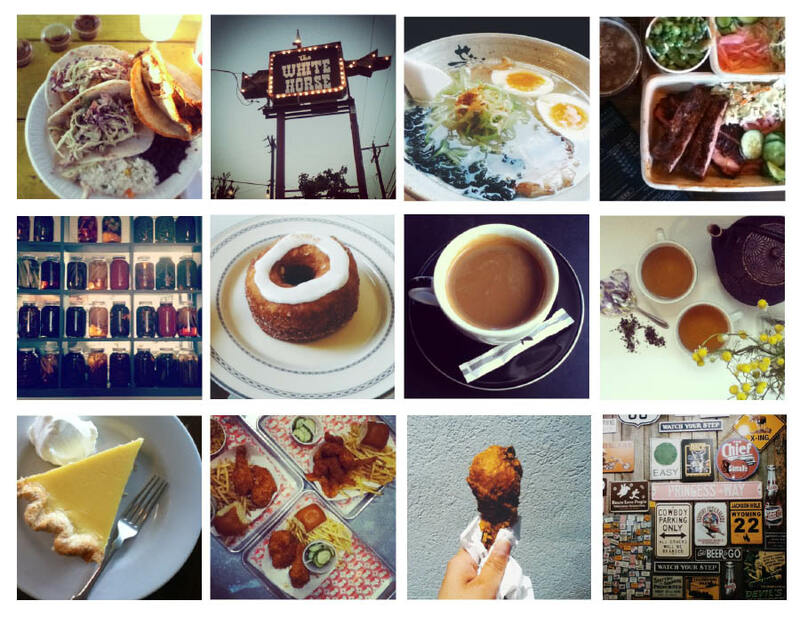 I love to hear what your favorite brunch spots in New York City are or a brunch spot worth traveling out of state for, so don’t be shy and leave a comment. Cheers! Pizza Bianca: Sullivan Street Bakery is celebrating their 20th Anniversary and for a limited time only they are offering their signature pizza bianca for only $1. Until April 17, so get there fast. Hong Kong Hot Cakes: These are similar to the French madeleines, Southern hot cakes or Belgium waffles. There used to be a popular red kiosk selling Hong Kong Hot Cakes on Mosco Street in Chinatown. The lines would be as long as the lines for cronuts. It closed in the early/ mid-90s and now are sold in street carts in various locations in Chinatown. The way it is made is on a cast iron waffle-like pan with no more than few ingredients of egg, sugar and flour. A treat for all ages. $1 for 15 pieces. Hot and Sour Soup: Located in one of my favorite streets in Chinatown on Mosco Street, Fried Dumpling is a hole in the wall shop and has a variety of items for $1 including fried dumplings of course. Although, I recommend having their hot and sour soup instead. It’s served piping hot and perfect for a frigid day or to fight a cold. There are generous amount of ingredients in the soup that includes tofu and mushrooms. Though avoid going on weekdays after 3pm as the place will get very crowded with school kids. Herbal Tea: I have been going to Fong Inn Too since I was a child. My mom would buy their turnip cakes or soy pudding dessert. Since then I have become a regular myself but for their $1 herbal tea. It comes in black and unlike many herbal tea, it is not bitter and naturally sweeten. It is also said to get rid of toxins or inflammations. Its purpose, although not proven should have similar affect as juice cleansing if not greater and much friendlier on the wallet. If you’re lucky sometimes they bottle the chrysanthemum tea for $1 too. Assortment of cookies $1 each (lavender shortbread, earl grey tea, peanut magic bar): I’m obsessed with Bakeri in Williamsburg, Brooklyn and their $1 assortment of cookies have me return consistently. My favorite is Bakeri’s lavender shortbread cookie. I usually dislike lavender baked goods because of the perfume taste but this version is fresh and subtle that I could eat a jar of it. Its a charming little cafe, bakery and I guarantee it will be hard to resist not to spend more than a dollar. Egg Tart: A variety of baked goods in Chinatown are still $1 or less but if you must choose wisely on how to spend the dollar, I recommend the egg tart from Golden Manna Bakery. The inner egg has the texture of a flan or a custard on a flaky miniature pie crust. It’s a favorite among many during dim sum or for dessert. Assortment of bagels: New York City hands down has the best bagels and is an iconic food item. It’s cheap and satisfying. Bagel Bob’s in Greenwich Village has probably one of the best hand made boiled bagels and on Mondays from 4-7pm they sell their freshly baked bagels for only $.45 cents! It’s so cheap it almost feels wrong. There is usually a mini line but moves efficiently with friendly counter staff, armed and ready. Bialy (onion, garlic, or poppy seeds): Kossar’s Bialys on Lower East Side is an old school bakery making their signature bialys for over 65 years. The recipe and craft is based on traditional methods past down through generations and truly defines the meaning of artisans. 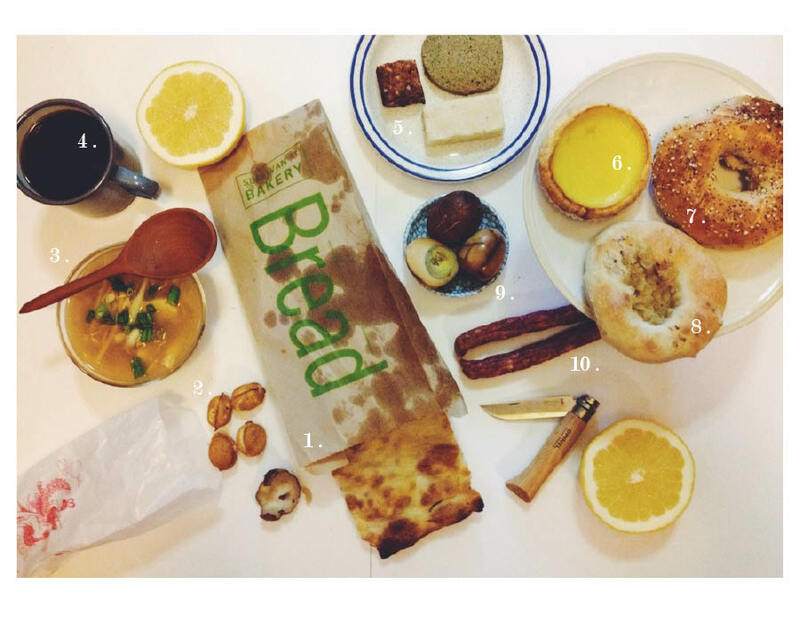 For $.90 cents each, there are 3 kinds of bialys, traditional- onion, garlic and poppy seeds. Tea Eggs: I got the idea of writing $1 food when my local dry good store on the corner of Catherine and Division street introduced selling tea eggs, 3 for $1. The aroma of the marinated tea, soy sauce and spices could be smelled from a distance and it’s a great replacement as a hand warmer in the winter months. Since then they have raised it to $1.25 but it’s worth the extra quarter. Chinese Sausage (lap cheong): Chinese sausage is cured meat and is similar to chartcuterie. There are various grades of Chinese sausages but my favorite is their house cured one which you can get it loosely, 2 for $1. It’s one of my favorite ingredients and a better alternative to Spam meat. In fact during Hurricane Sandy, it was one of my survival gourmet food items. All you will need is a butane gas stove, clay pot, rice, water and Chinese Sausage and you have yourself a clay pot rice or an inexpensive version of paella. a. Corner of Catherine St. and Division St.
c. Corner of Hester St. and Elizabeth St.
Parkway Bakery and Tavern /// I started my 2012 with a sister bonding trip to New Orleans. It’s been a city I have long awaited to visit and with Hurricane Katrina and the Gulf coast oil spill it continuously put the city in the spot light in a negative way which caused the delay to journey down until now. New Orleans is a unique city with multi-cultural and flavors and is highlighted through the origin of food. I was recommended to several restaurants but the one I am still salivating over is Parkway Bakery and Tavern. Known for their Po’Boy sandwiches and probably the best sandwiches I have ever eaten. We ordered the catfish po-boy and the grilled smoked hot sausage pork link po-boy and an order of chili cheese fries along with two vintage bottled of Barq root beer. The decor, ceiling fans and the Parkway Bakery waitstaff were wonderful with their Southern hospitality making this place worth the trip visiting New Orleans. Read more here: Fat Tuesday Indeed. The Breslin /// There are very few women chefs in the culinary industry restaurant world and within that circle, the chefs I admire includes: Chef Gabrielle Hamilton, Chef Anita Lo and the goddess Chef April Bloomfield. I first had a dish by April Bloomfield at Le Grand Fooding in 2010. It was a Blue cheese inspired dish, a Beef, Bleu D’ Auvergne and Suet Pie…mm. For my birthday this year, I had a birthday brunch at Essex Street with my friends and a post birthday lunch at a restaurant of my choice with my boss. Thanks RLV! I had chosen The Breslin because I have been dying to try the lamb burger. It is probably one of the most photographed, yelped, twittered dish at The Breslin but photos and what you read will not do its justice, most things are better when you try them. A rustic and beautifully presented burger on a butcher block along with a side of fries or chips as the British calls it was as expected mouth watering and incredible! A good way to celebrate another year older. Phayul Tibetan /// I received an impromptu invitation to a Tibetan community artists dinner gathering from my old friend, a Tibetan artist GG. I had to journey out to Jackson Heights, Queens which little did I know it was more than a little India but also resides a great population of Tibetans and Nepalese which means the food must be pretty darn good, authentic and budget friendly. Phayul Tibetan is a small Tibetan family owned restaurant, hidden on the second floor. Greeted with “tashi dele”, hello in Tibetan. We were seated in a long communal table and ordered multiple dishes to share in family style. Signature dishes included laphing made with mung bean into jelly noodles with chili sauce and parsley and momos – Tibetan dumplings. We concluded our meal with Tibetan sweet butter tea – po cha which is misleading because it is actually salty and has an acquired taste – similarly to my mother’s DIY teeth whitening recipe: baking soda, hot water and salt. Sipping teas and exchanging stories in a hidden gem in New York on a drizzly rainy evening into the midnight was poetic. Roberta’s /// Located in a remote part of Bushwick, Brooklyn an industrial factory neighborhood, Roberta’s is packed on a daily basis. My friends and I, a group of 4 people waited for over 2 hours to be seated. Roberta’s is known for their seasonal pizza menu. They would have their usual margherita, tomato, basil and mozzarella but every time you go, there is something different, innovative and delicious to offer. The vibe of the restaurant is great too. Roberta’s is beyond just a restaurant , there is also a radio station streaming from the restaurant, known as Heritage Radio, a station with all things food related including Saxelby Cheesemongers Cutting the Curd segment all about cheeses. There is also a garden where Roberta’s grows their own basils, tomatoes, and produce when weather appropriate for their pizza. The thoughtfulness and creativity of Roberta’s is what makes it more than another New York City slice and worth making the pilgrimage here. Pies ‘n Thighs /// I have a pretty high standard for my fried chicken and especially after visiting New Orleans which made my standards even higher. I didn’t think I would come across fried chicken as good and as reasonably priced as New Orleans but Pies ‘n Thighs proved me wrong. Located in Williamsburg, Brooklyn, this place is hillbillyburg good. I recommend for the first timer to try the fried chicken box, it’s a million times better than KFC and Popeyes, with 3 pieces, a side and a biscuit. What’s great about Pies ‘n Thighs is their sides and it goes above and beyond the overly processed mashed potatoes, mac n cheese. The sides are refreshing with a take on what is in season at farmer’s market such as kale, string beans, berries, and currently a lot of squashes on the menu. Ocakbasi Dürüm Ve Kebap Salonu /// It has been 4 years since I have taken an international trip and this past May I had the opportunity to travel with my friend (MN) to Istanbul, Turkey and Athens, Greece and Greek Islands. Read more here: Along the Mediterranean Sea in Twelve Days. One place that really strike me was Ocakbasi Dürüm Ve Kebap Salonu, it was hidden in an alley way near the Spice Market in a market place with only few tables indoor and outdoor seating. Dürüm is a word seen in many Turkish menus and on signage. And it will very likely have grilled meats and flat breads. At Ocakbasi Dürüm Ve Kebap Salonu, it was a feast platter made for a sultan for a modest price. The platters of grilled meats were seasoned and cooked to perfection. We were lucky to stumble upon this great restaurant. Nefeli /// Without knowing it was a hiking and eating tour, a 9 day guided tour with REI, this trip was the odyssey of a lifetime. Greek cuisine is far more than the diners in New York City and spinach pies, it is full of flavors, nutrition and variety from beans to meats. One of my favorites includes an authentic gyro pronounced yeer- oh, was from a restaurant in the Greek Islands of Tinos, called Nefeli. The meal in it’s entirety was mouth watering but one dish in particular made its impression on me that I have since been inspired to use more parchment paper in my cooking. The dish at Nefeli was rather a simple dish, a baked parchment chicken with aromatic rice but the method created a crispy texture on the chicken skin and the flavors absorbed making it a well- balanced dish. And since my travels, I have cooked and experimented with fish, sausages, and vegetables with parchment paper along with my handy convection toaster – oven. It is what traveling is all about, being inspired. Totto Ramen /// After watching Batman’s Dark Knight in late August, I found ourselves in Totto Ramen area between Hell’s Kitchen and Columbus Circle. Japanese ramen is one of my favorite comfort foods and Totto Ramen really hits the spot. With very few seating and the popularity of the restaurant, there was a long wait but totto worth it! I always take the bar seats if the opportunity is given and luckily we did. Of course the reason is to get the full experience and to observe the cooking action, it’s so much more entertaining than a hibachi grill. Surely, New York City have experienced a growing popularity and demand for Japanese ramen joints. But what makes Totto Ramen stands out from the pack is their broth since it is a chicken broth instead of the common pork broth most ramen places serves with and the handmade ramen noodles cooked al dente is perfect. What I appreciate even more is it is actually cooked by Japanese! Toby’s Estate Coffee /// Among what makes up a New York City block and within less than a mile radius are: banks, drugstores, restaurants and coffee shops. These are the quintessential of a New Yorker every day needs and if it is the beauty and quality of Toby’s Estate Coffee in their Williamsburg shop, then I would be in pure heaven and New York City would be a better place. It was in April when I discovered the new coffee shop and ever since I have been addicted. The interior decoration resembles my dream loft apartment living room and the coffee roasted freshly at the shop literally in a Probat coffee roastery fills the room with the scent and sound of a genius at work. The coffee is consistent each time, which I recommend their espresso beverages: a macchiato, americano or a latte. Also while at it, take home a bag of coffee beans for your loved ones. Má Pêche /// One of the perks in working in the food industry is being invited to forums revolved around the subjects on food. In late August, my boss was a speaker for a forum, a food series created by Má Pêche in collaboration with NYPL, pretty cool combo. The subject was on street food vendors, from pedlars to the current popularity of gourmet food trucks. Inspired by the subject, the theme for the lunch was street food but done in Má Pêche style. This is my second David Chang’s restaurant empire experience – adding to the list with Momofuku Ssams Bar. It was an informal cafeteria style and coming back from a trip recently to the Middle East and the Greek Islands, Má Pêche’s take on lamb with tzatziki was a rather nice interpretation and hinting for a visit soon for a real meal. Lan Zhou Handmade Noodle /// Disgracefully, I was introduced to Lan Zhou Handmade Noodle by none other than my white friend, thanks WG! Located on East Broadway, Chinatown and owned by Fujianese – which is probably the reason why I always shy away from because I speak the lingo and its often very sketchy looking. But this place is different, there is a secret weapon and that is a non-Fujianese noodle master who really makes hand pulled noodles. The menu is no more than 20 items: bowls of noodle soups, dumplings, and glutinous rice balls (sweet and savory) all range from $2 – $5.50 per dish. The handmade pulled noodle is impressive. The texture is quite the way I like it, fresh, al dente unlike the doughy hand pulled noodles and the combination of soup noodles range from lamb to vegetables. My favorite is the fried dumplings and dry noodle with minced pork sauce, a meal under $10. Le Diner en Blanc /// It never crossed my mind that I would participate in a flash mob but of course if any it would be food related. Le Diner en Blanc started originally in Paris, France as a garden party with guests dressed in white for a picnic and quickly grew into the size meant for iconic locations like the Eiffel Towel, the Louvre and Nortre Dame which is kept secret until the last minute. New York City adapted this concept and now is a global celebration. My sister and I participated in this year’s second annual Le Diner en Blanc and planning for it was stressful because less than a week prior I received an unexpected invitation and was ecstatic! The event is BYO: table, chairs, food, table clothes, utensils, decorations, etc. The rules was to dress elegantly in white and it had applied to white table with a certain dimension, white chairs, and plates. Sounds crazy right? We spent a whole weekend planning and scouting for the table and chairs but eventually came to a solution. How it worked was we picked a group to meet and there was a team leader for each group and this was happening all over Manhattan who then takes us to our secret location and the only method according to the rules is to take the subway. It was during rush hour where we mobbed the trains with everyone dressed in white and carrying bulky tables, chairs, and picnic baskets to a secret location and this year was at the Lincoln Center. When everyone finally settled down with tables and decorations set up, everyone was in awe. It was visually spectacular. To witness and experience a gathering of 3,000 strangers from all over the city for a giant picnic at Lincoln Center is one of many things that makes New York City so special. I must say I ate really well this past year and when I step onto the scale it reflects that. But as the saying goes, life is short and if it looks good, eat it! Part of growing up is through exploring and doing things that is out of our comfort zone and experiencing changes and events. This past year, our family welcomed a new addition to the Yeung family, Allyson Nora Yeung, I jet set to the South and across the sea and have also experienced and witnessed how fragile humanity can be when Hurricane Sandy hitted and attending to two funerals. But I also witnessed how resilient humanity can be, when tragedy hits people come together to support each other and give each other condolences that creates a ripple effect. That is what food does, it is beyond the trend, the popularity and perfecting the craft but the impact food has to bring people together because frankly, everyone needs to eat whether in good or bad times. 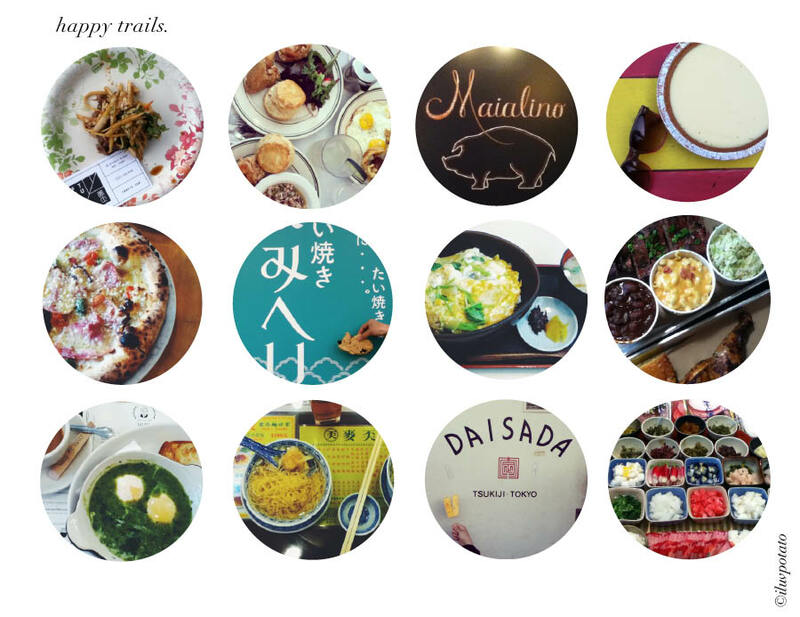 Thank you to everyone who shared a meal with me in 2012. Happy holidays and to a healthy happy new year! Cheers!